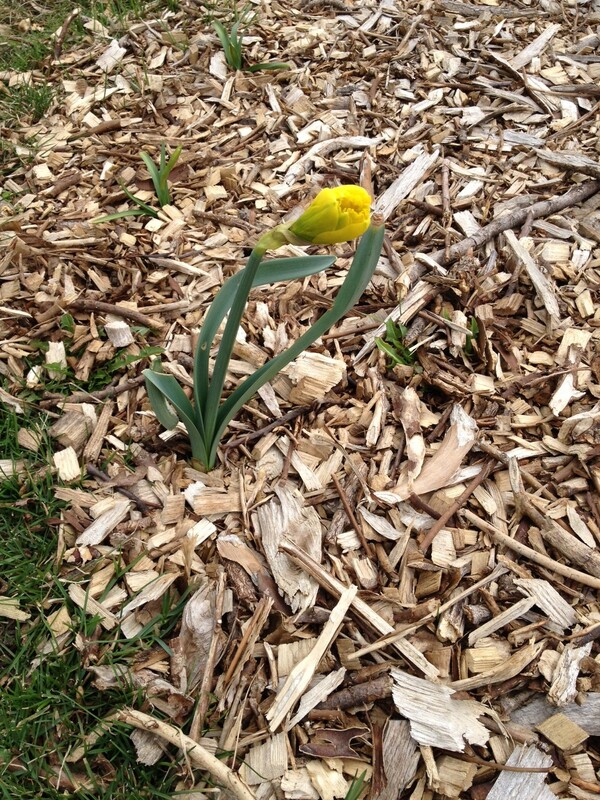 The first daffodil to almost bloom…. 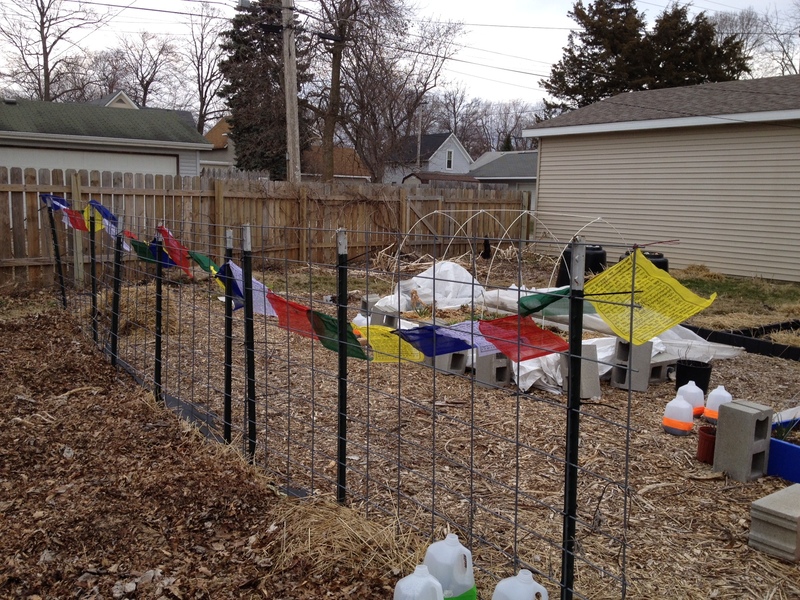 New prayer flags went up yesterday — specially made for outdoor use, unlike the faded cotton ones I finally composted. 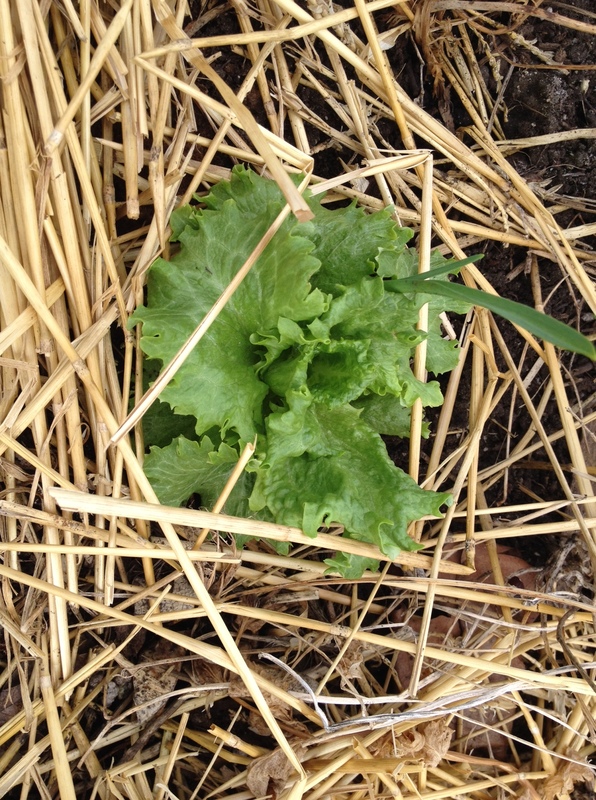 The miracle lettuce that survived when cold hardy kale did not. Garlic pokes up behind the lettuce, since I did not expect it to survive. 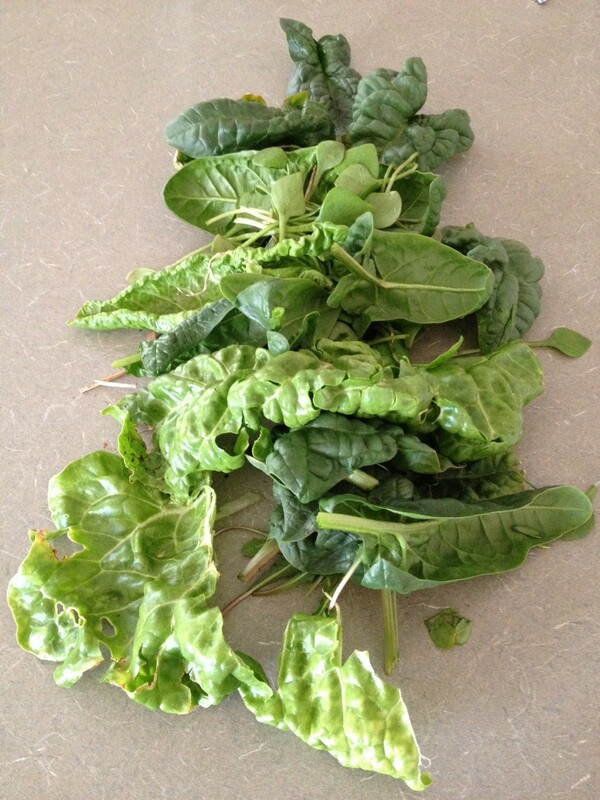 Spinach, chard, lettuce, garlic, fava bean sprouts, miner’s lettuce, carrots, parsnips and garlic chives … with some other seeds just starting to sprout, too. 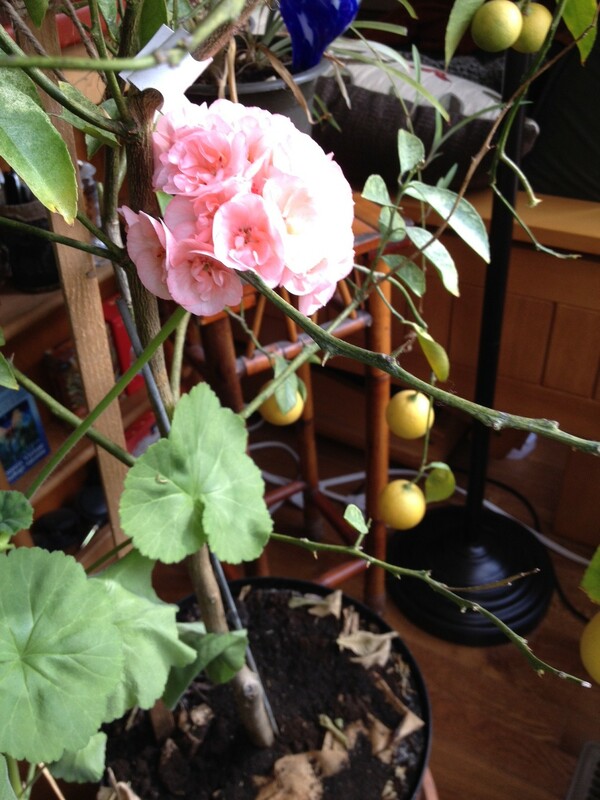 Blooming geranium, nearly ripe lemons and just a hint of the peach tree awaiting transplant. 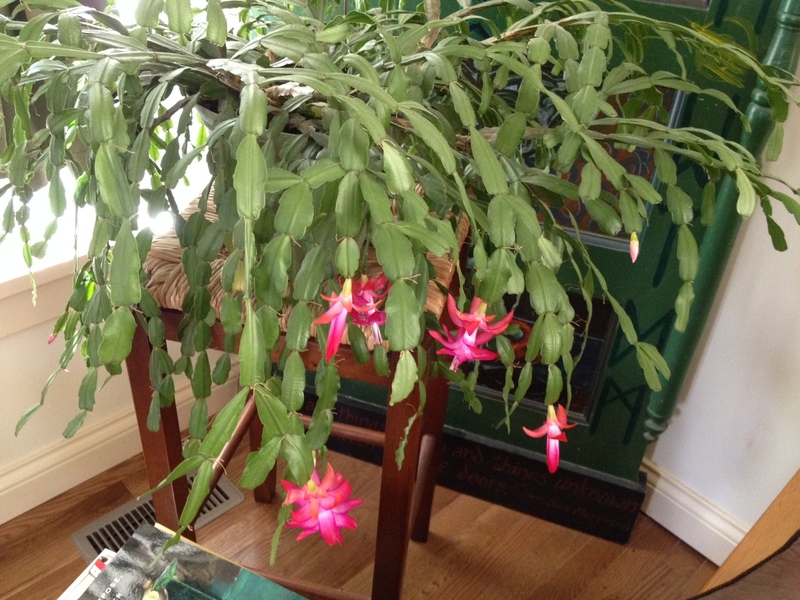 “Christmas” cactus embracing the bloom in April. 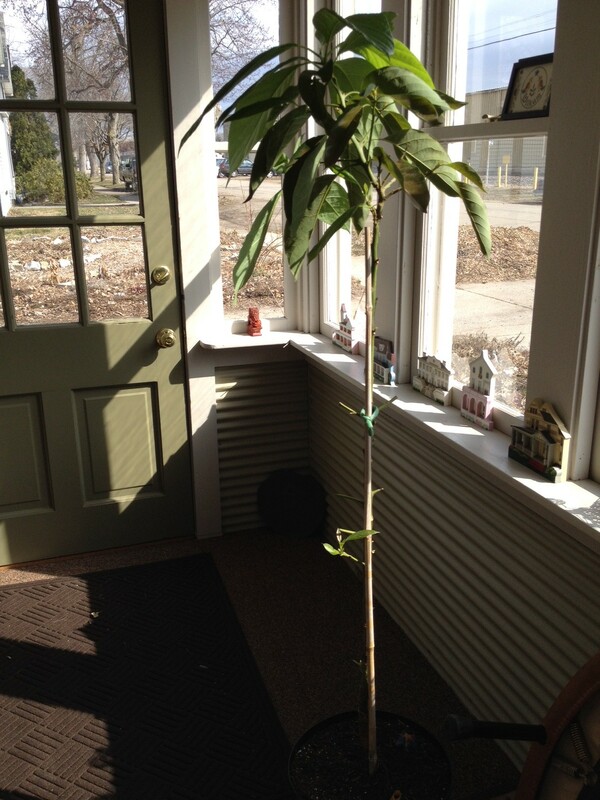 New plum tree awaiting transplant outside once the outdoor trees show similar leaf levels. We’ve also got the slightest hints of tulips and hyacinths outside, the regreening of the yarrow, irises beginning to stir back to life, and chives starting to green themselves again, baby dandelion leaves, fava bean sprouts in the tiered raised beds, garlic and shallots all over the place, stirrings of alpine strawberries and just the tiniest, subtle green on the perennial sea kale. 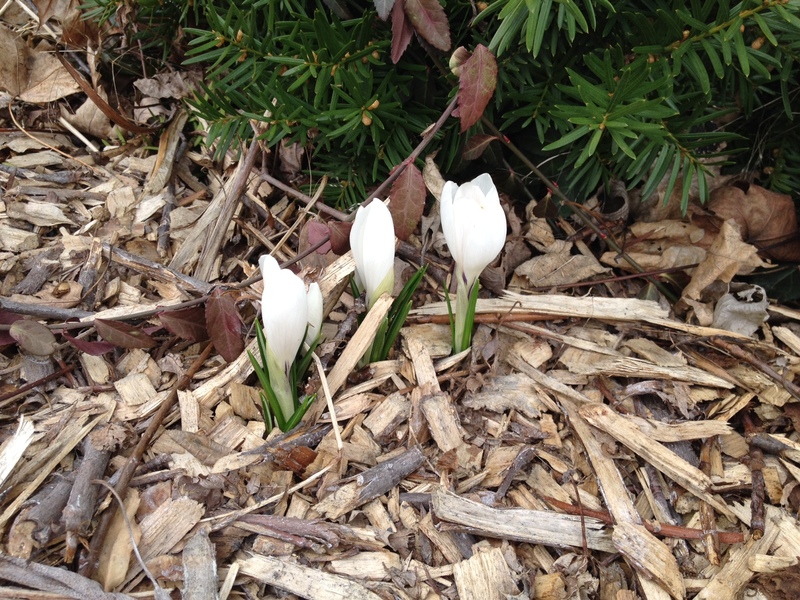 Yes, indeed, despite the brown, greys and wild temperature swings, life goes on! Haha, weather in May is between 20 and 80 degrees! Pack accordingly. 😉 Of course, I know someone around your size who might have some old clothes of yours that you could borrow! Yes, try being a vegetable in that weather! I just planted a bunch more cool crops, but the really cold hardy ones can’t handle anything above 70. It’s always kind of a mixed bag this time of year. Last year we had snow after my birthday that killed my pumpkin vines! I’m not sure how it works as a mulch. 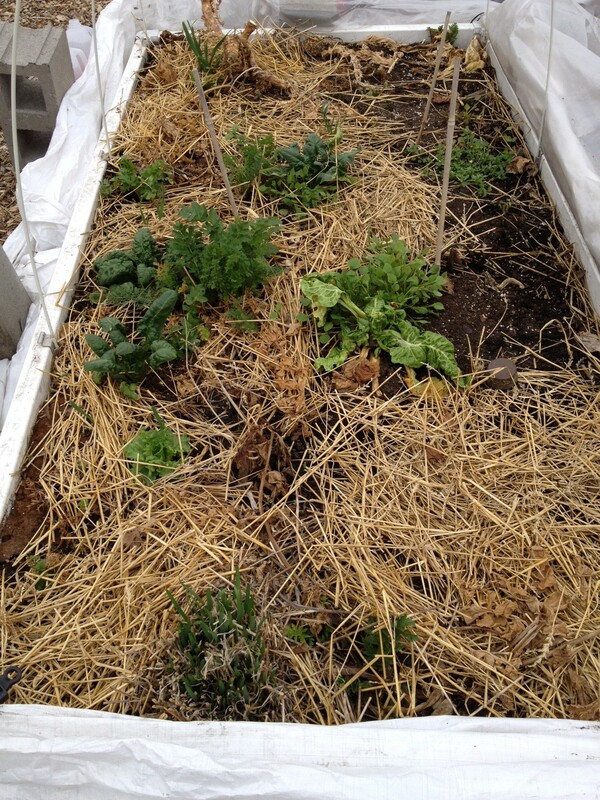 I don’t like how it looks, but the gardeners and farmers I know here all use straw mulch, so I thought I’d give it a go this year. I’ve used it before in lasagna gardening, but not as a top mulch. My understanding is that it breaks down well. I’m hoping to attract fewer earwigs than with leaf mulch. They really do a number on my crops and have resulted in slugs getting a much larger blame than they deserved! Anyway, we’ll see how the straw goes. I have bags and bags of leaves, too. I don’t know anything about orchard grass. My main concern with the straw is that I doubt it’s organic. At some point, I have to figure that with all the wood mulch, earthworms and mycellium, things will take care of themselves. If you’re wanting to be totally pure, then maybe the orchard grass is better. I have rye seeds for a fall cover crop, which I thought to grow and then use that as the mulch; however, I’ve since heard rye is toxic to new plants for the first three weeks after cutting. That kind of dampened my enthusiasm! 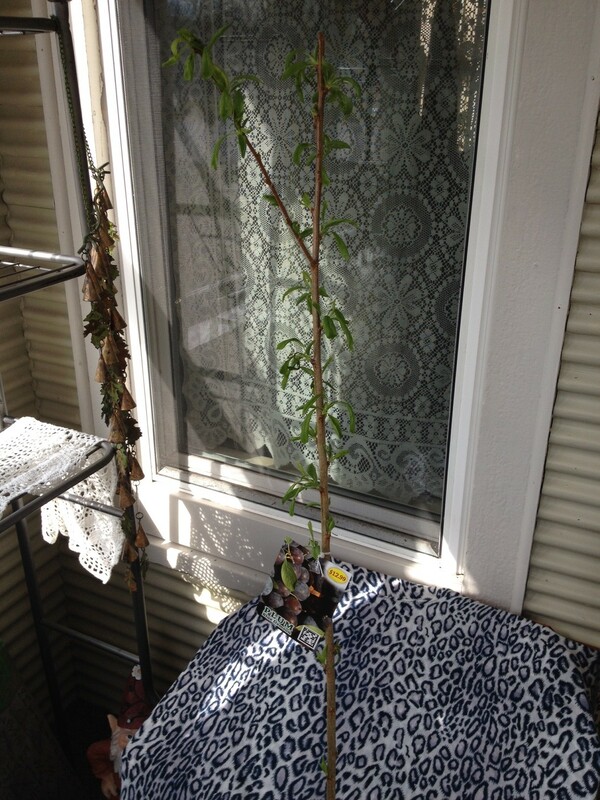 Forgot…planted two plum trees along with an apple and a cherry as well ! !